With the third week of classes rolling in, we are getting settled into our routine out on the farm for the 2018-2019 school year. That means our student farming crew is ready for action, and ready to host farm volunteers! Weed n’ Feed is our weekly volunteer opportunity! Every Friday, transportation leaves the Dickinson campus at 1pm and returns at 5pm. You will spend a few hours working in the fields, then eat a delicious snack, and have some down time on the farm before returning to campus. It’s the perfect way to escape the hustle and bustle of campus! 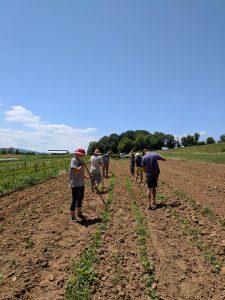 If you want to get out to the farm more often (or Fridays don’t work for you), check out our updated volunteer information here. Contacts are listed under each shift, so send them a text or an e-mail to organize transportation and timing for your volunteer shift. Have more questions? Contact farmcoordinator@dickinson.edu.